The Philippines wants to have a big chunk of the approximately seven million scuba divers in the US with an average annual income of $100,000. Research on the US travel market by the Diving Equipment and Marketing Association (DEMA) say every year, the numbers add up to around 160,000 new US scuba divers getting their licenses from the top three diving associations, PADI (Professional Association of Diving Instructor), SDI (Scuba Diving International) and SSI (Scuba Schools International). 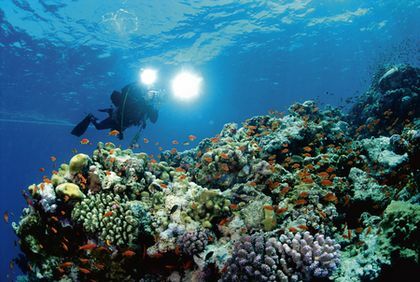 The Philippine Tourism Secretary said DOT made sure the Philippine dive sites are consistently in the radar of the US dive industry as it participated in back-to-back events, the Bay Area Dive Show, in San Jose, California and the Tacoma Dive and Travel Expo in Washington. The DOT is slated to participate in another dive show entitled the SCUBA Show on at the Long Beach Convention Center, Long Beach, California. Tagging the US active scuba divers as a recession-proof market, Durano said: "These indicators compel us to be more persistent in promoting our dive sites as the travel lifestyle of this market is largely unaffected by the crisis. "Apart from the lure of our competitive packages, this market has exhausted neighboring spots and are looking for more unique locations to explore." As part of the Coral Reef Triangle, the Philippines lies right at the center of the coral reef biodiversity, sharing the world’s richest marine life with Indonesia, Malaysia, Papua New Guinea, East Timor and the Solomon Islands. “We have always been adjudged as one of the world’s best dive destinations, with more than 2,500 species of marine life, from macro types like the pygmy seahorse to the sea giants such as the barracuda, 34,000 square kilometers of coral reefs, 25 shipwreck dive sites, and a total of 60 registered dive sites,” added Durano late Thursday afternoon. Hand-in-hand with vibrant promotion are efforts in preservation and conservation of marine life. “We complement our marketing campaigns with projects such as reef preservation and community tourism to help the locals generate livelihood and sustain their natural wealth,” said Durano. “These foreign professional scuba divers also acquaint us with better understanding of the abundance of our environment and proper ways to conserve it,” he said. The first-ever dive event to be held in the Bay Area, the Bay Area Dive Show attracted more than 100 exhibitors comprised of dive professionals, tour operators, and consumers. “Divers from the Bay Area are looking for alternative wrecks, and we have a variety of shipwrecks from the Spanish galleons to the World War II vessels,” said Undersecretary Eduardo Jarque, Jr., of the DoT's Tourism Planning and Promotions. A 20-feet backdrop showcasing the country’s majestic underwater paradise was featured in the Tacoma Dive and Travel Expo, the largest consumer diving and travel show in the Pacific Northwest. “We have one of the most welcoming and hospitable English-speaking dive guides, tropical weather, and warm waters,” said Jarque on the country’s distinction as a dive site. Jarque further acknowledged that the DEMA study showed that 71 percent of the scuba divers are married; they bring their family along to their expeditions. “We offer other exciting activities like birdwatching, whitewater rafting, zip-lining, and even shopping which make for a great destination for the whole family,” he said.